The property was beautiful, and had all the amenities that are possible. The beach was beautiful, and the rooms were very clean and nice. Many of the staff were nice, especially the cleaning staff. However, the building was outdated. When we arrived, the lock to the patio had rusted shut. They fixed it immediately but the property was not in 4 or 5 star shape. I would rate it 3 stars for a resort. Staff was friendly and knowledgeable. Close to the airport and many restaurants. We were on in Kauai for 3 days and the Kauai Beach Resort definitely more than met all our needs. The property was beautiful. Very friendly and helpful staff. Clean facilities. Very nice property, friendly and accommodating staff. Property very well maintained. They advertise three restaurants and food comes out of one kitchen and all the menus are pretty much the same. That was the only disappointing part. Wish they would’ve had variety. Overall good , friendly helpful staff a little over priced Superbowl Nachos were made with Velveeta cheese that was as tacky as it comes for a "Resort"
Loved the location! Also the property was exactly as shown in pictures. Beautiful plantation style lobby and very clean. Food excellent! Over all, the facility was good. The carpet in the room was a little old and could use an update. On one occasion they forgot to replace our towels it took several hours to finally have someone bring us towels. Over all experience was good. We were told that we were upgraded to a remodeled room. Room did not look remodeled, carpet was very old and dirty looking. Also, we were there for a week and everyday they would call or ask if we wanted our room cleaned, it was kind of annoying. It felt like that they did not want to clean, but did it because we requested it. One day we were not there and our room wasn't even cleaned. I had to call to get at least clean towels. Beautiful setting for this lovely hotel. The staff were wonderful and the food some of the best on the island. Hotel staff very nice. The food in Naupaka is excellent. My son's slippers disappeared from the poolside but it's not the hotel's fault. Friendly staff, great room, comfortable bed, only steps to the beach. 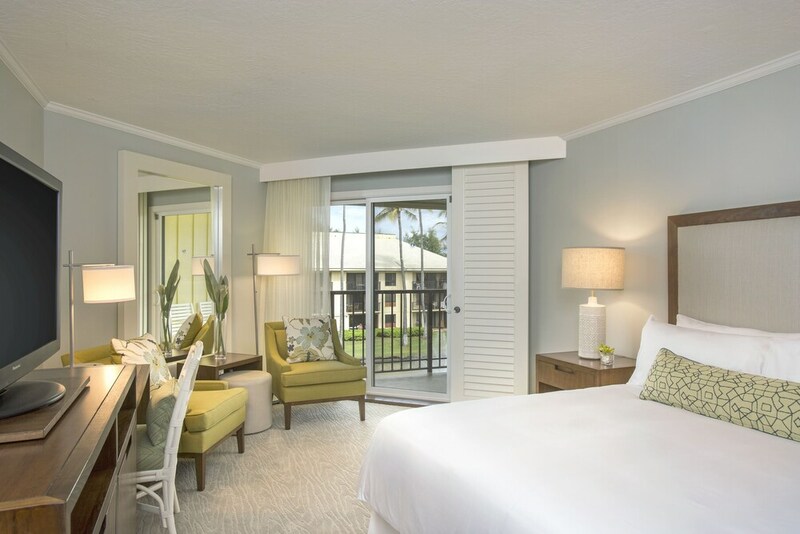 Located in Hanamaulu within a short walk of Nukolii Beach Park, Kauai Beach Resort is within 2 miles (3 km) of Wailua Golf Course. This 317-room, 4-star resort welcomes guests with 4 outdoor pools, 3 restaurants, and free in-room WiFi. Enjoy dining at Naupaka Terrace, one of 3 onsite restaurants. Order from room service to satisfy your hunger without leaving your room, or meet other guests at the free manager's reception. Start each morning with buffet breakfast, available for a fee from 6:30 AM to 10:30 AM. A TV comes with cable channels, and guests can stay connected with free WiFi. Beds sport down comforters and the bathroom offers a hair dryer and free toiletries. Other standard amenities include a lanai, an iPod dock, and a refrigerator. At Kauai Beach Resort, guests enjoy 4 outdoor pools, a children's pool, and a fitness center. Parking is USD 25 per day (USD 25 per day for valet parking)—but if you prefer not to drive, catch a ride in the free airport shuttle (available 24 hours). Multilingual staff at the front desk are standing by 24/7 to help with tours or tickets, securing valuables, and luggage storage. Other amenities at this beach resort include a spa tub, a sauna, and free WiFi in public areas. Aloha, Mahalo for your feedback! Mahalo for staying with us!! We appreciate your feedback. Naupaka Terrace - Restaurant serving breakfast and dinner. Driftwood bar and Grill - Poolside restaurant serving lunch. Shutters Lounge - Lobby lounge. The resort has 4 outdoor swimming pools and a children's pool. A waterslide, a spa tub, a sauna, and a fitness center are other recreation options. The preferred airport is Lihue, HI (LIH): 8-min drive, 3.2 mi/5.2 km.